I received this novel from Macmillan-Tor/Forge through NetGalley, in exchange for an honest review: my thanks to all of them for this opportunity. As a fan of author Seanan McGuire, I could not let myself miss this new book that promised to be something different from her usual Urban Fantasy offerings: from GoodReads I learned that the Deadlands book series is derived from a role-playing game, and since I know nothing of the gaming world I wondered if this might have somehow prevented me from fully enjoying the story, but I should not have worried because Boneyard walks quite surely on its own legs and what’s more it’s the kind of story that draws you in and does not let you come up for air until the end. Which is hardly surprising at all, since it’s Seanan McGuire we’re talking about after all and, no matter how biased this might sound, her craft as a storyteller is such that she can draw you in and keep you there, not in spite of the darkness and the fear, but because in her hands these elements can become as mesmerizing as more light-hearted ones. The story in short: the Blackstone Family Circus faces some difficult decisions, since winter is approaching and the show has not gathered enough income with their tour to survive comfortably during the cold season, so they are debating whether to accept a potentially remunerative gig in the Oregon settlement of the Clearing, a place where some companies are rumored to have reaped good earnings while others suffered unexplainable losses. Annie Pearl is the keeper of the “oddities”, bizarre and often deadly creatures that she gathered all over the country, like the nibblers – piranha-like fish cursed with perpetual hunger and terrible teeth that jut “out at all angles, making it impossible for the fish to feed without biting themselves”: Annie has been with the circus for several years, and we soon learn that she escaped with her mute daughter Adeline from the house of her worse-than-abusive husband, and has been hiding with the circus ever since. Once the company reaches the Clearing, a bowl-like hollow surrounded by a dense, strangely looming forest, they find the settlers less than welcoming and prone to bizarre behavior, to say the least. On the surface Boneyard is a story about horror and the supernatural, focused on surviving in a hostile environment that’s splendidly represented by the forest surrounding the Clearing, a place where trees seem to possess a life of their own and a malicious will, and shadows can take shape and form, pressing on the unwary travelers to sap their energy and life. Yet, on a deeper level, it’s a tale about facing one’s fears and refusing to succumb to them, about never giving in to despair to the point it might consume us: the legend of the wendigo that’s so skillfully employed here is indeed a case in point, where the hunger-stricken colonists give in to their deprivation and become the beast, devoured by a craving for flesh that can never be sated because it goes beyond the mere material plane and ends destroying one’s soul. Annie has indeed been hiding for a long time, her sole goal that to protect Adeline: she left her home town of Deseret with literally only the clothes on her back, her infant daughter and the lynx Tranquility and we see through the artfully inserted interludes what she left behind – a man whose unwavering faith in science and in his god-given right to own her, body and soul, reveal him as a true monster. Despite her need for concealment, however, Annie has grown stronger: caring for the “oddities” in her wagon she has learned to master different kinds and levels of fear and when push comes to shove she understands that she needs to take survival into her own hands and be the aggressor so that she will not become the victim. Her example helps others find their own courage and the will to fight against the darkness: in this young Martin and his girlfriend Sophia are wonderful examples of timid people who, once faced with the prospect of annihilation, prefer to go down fighting rather than cower in fear waiting for the monsters to kill them. The other great element of this story is the unstated but always present question about the nature of monsters and how the worst of them always start in human form: the wendigo I already quoted looks like a nightmarish beast, its appearance nothing but the outward manifestation of the shadier, more horrifying sides of our soul; the inhabitants of the Clearing have accepted the price to be paid to the flesh-eating creatures in the woods turning into willing accomplishes, even the younger among them – as shown by the kids who willfully send Adeline into the woods knowing what might find her. The worst monster however remains Michael Murphy, Annie’s husband, whose depths of depravity and madness I will refrain from describing, leaving this discovery to my fellow readers. By comparison, the creatures that Annie shows to the paying customers, the “oddities” meant to engender fear and revulsion, end up looking like friendly beings, the danger they represent merely coming from inescapable nature and not from the exertion of a twisted will – and their contribution to the story’s development does nothing but reinforce this notion, particularly in the case of Tranquility the lynx, who deserves a special mention. Once more Seanan McGuire reveals her skills as writer, offering us a gripping story and some unforgettable characters: no matter the tale she chooses to reveal, rest assured that it will be an amazing experience. Think about “The Day of the Triffids” blended with “The War of the Worlds” and “Invasion of the Body Snatchers” on a steampunk background: this is what this story made me think about, even though there is much, much more to it. These concepts, handled by the deliciously evil writing skills of Seanan McGuire, have created the tale of an invasion that is also a commentary on human flaws, poking fun at our ingrained short-sightedness. Told in the style of a 19th Century memoir from a lady of high breeding, it recounts the invasion and conquest of Earth by an alien race of… vegetables, and if the premise makes you smile, think again, because if the tone of the account is deceptively gracious and civilized, the reality it depicts comes across as efficiently brutal, and it chilled me to the bone. The first wave of the invasion by what will be later termed “The Vegetable Empire” starts with the arrival of seeds all over the world: the only one who manages to thrive lands in 19th Century England in the garden of Sir Arthur Blackwood, the royal botanist – and promptly proceeds to eat Sir Arthur’s sister’s maid, taking on her appearance and memories. Far from being appalled by what happened, the Blackwoods take the seedling into their circle, as a novelty and a subject of polite study, even bestowing on her the name of Lady Antheia, from the goddess of flowers. As Antheia later writes in her memoirs, “better had my first encounter with humanity been a man, and not a woman of low station with no family to mourn her. Better for who, I cannot say”. The lack of a shocked reaction to Antheia’s method of interaction with humans is commentary enough on the period’s regard for household help and of their short-sightedness about the creature they have welcomed into their midst with little or no thought for her true, blood-thirsty nature: after all, Antheia comments, all they see is “the very flower of English womanhood, with my curves trained to the corset’s embrace and my skirts hanging full and demure down past my ankles”. She looks like a woman, therefore she can offer no threat, can she? When six years later the bulk of the invading army arrives, England and the rest of Earth are unprepared for the assault, not understanding how their perceived superiority in culture, breeding and arms (that include airships and ray guns and so forth) seems to melt in the face of a veritable shower of seeds that cover the ground and start sprouting invaders, with appalling results. As a shocked Sir Arthur is forced to accompany Antheia to the Queen to negotiate a surrender, he struggles to wrap his mind around the incursion, and Antheia’s reply forces him to consider what the British Empire has done until that very moment, taking resources they wanted and needed: “that’s the first reason you did what you did, and that’s the first reason we do what we do”. As always, Seanan McGuire’s writing skills make this story shine in a delightful way, not in spite but because of the main character’s personality: even if your are not a reader partial to shorter works, I would recommend reading this one for the amazing experience that it is. I’ve often reviewed the works of Australian author Ashley Capes, whose writing range goes from fantasy to magical mystery to (albeit mild) horror: this time he’s tackling another genre, steampunk – but with a touch of magic thrown into the mix. The siblings Mia and Thomas are running from pursuers across a desert landscape: they just buried their deceased old protector and guide David, and their prospects look quite bleak, since over the horizon a dust cloud signals the approach of the hunters looking for them. Mia and Thomas are escaped slaves, the condition indicated by the hourglass tattoo on their arms: in this future or alternate history, slavery has returned – at least in Australia, so that the country has been isolated from the rest of the world because of this – and the siblings were the property of self-proclaimed King Williams, who wants them back because of their special gifts. 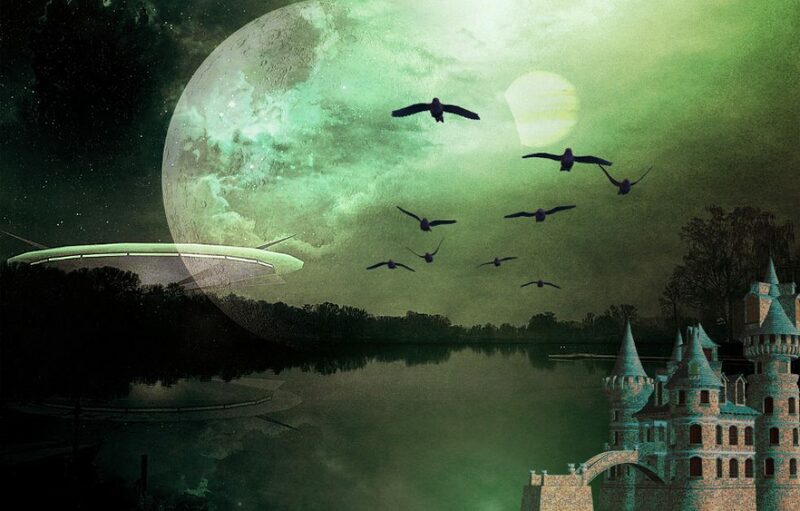 The clues in the narrative point to a classic steampunk background: steam-powered vehicles, the mention of airships (although this particular technology seems to have been lost by the ruling dynasty) and so on, and yet there are a few tantalizing mentions of a more advanced past, one that has now become more legend than actual memory. On top of that, however, there is magic: Mia shows a sort of precognitive ability, paired with her almost total blindness, and the knack of summoning a powerful creature with destructive powers; while later on Thomas discovers an affinity for steel, which he can bend or break with the sole strength of his muscles. The world in which they move is an intriguing one: even though it’s not immediately mentioned, we soon understand the action is based in Australia – if the author’s origins were not an obvious clue, there is at one point a mention of an iron fountain shaped like a kangaroo to make this clear. The country appears different from the one we all know, the desert encroaching on the fewer livable spaces, red dust creeping forward like a tide that covers abandoned cities and chokes everything and everyone. It’s not clear what happened, but at some point major environmental and political upheavals must have combined to create the present situation, one that nobody in power seems to care about. As the two siblings run for their life and freedom, while searching for answers about the past they seem not to remember – including the bewildering changes worked on them by the mysterious Alchemist, something they have no memory of, as well – we get to know this cruel, harsh world and its few islands of respite, like the colony established by former slaves on the shores of the ocean, or the rebel camp where a handful of fighters tries to subvert the rule of King Williams’ dynasty, or the freemen of the mangrove village no one seems to know about. I have to admit that these proved something of a frustration to me, because they were more like fleeting glimpses rather than deeper explorations of these enclaves, where I might have learned more about the past and the events that brought on the current situation. The same happens with King Williams’ capital city, a place of hard labor in the smoke-belching factories and of fear of terrible retribution for those who cross the ruler’s wishes: I would have loved to know more, and to see more than the quick peeks the novel afforded. On the other hand, this is a story carried by motion, the constant, running motion of the two fugitives trying to stay at least one step ahead of their pursuers, so I understand how it would have been difficult to… stop and smell the roses, so to speak: still there is that nagging voice, asking for more, that is not so easily silenced. My hope is that the next installments in the series will shed more light on the whole scenario and bring about a few answers as well. As an introduction to this world, The Red Hourglass is an intriguing offering that promises to develop into a quite exciting story, one whose follow-up I’m looking forward with great interest. Irene is a junior Librarian tasked with retrieving a particular book the Library wants, and following the last phase of her planned heist drops us straight into the heart of the story, through a narrow escape from animated stone gargoyles and hounds from Hell that carries the same kind of thrill as a dive into deep waters. Here we learn one of the most important peculiarities about Librarians: they can use Language (a special speech construct that is constantly adapted and modified to suit Librarians’ needs) to force inanimate objects like door locks to obey their commands – it’s not exactly magic as we usually consider it, but it’s an interesting detail and, at times, a very useful tool. Having managed a successful extraction from this particular alternate world, Irene looks forward to some well-earned rest to be spent doing what she enjoys most – reading books. This was what caused my instant connection with the character, even though she was not fully fleshed yet: Irene might be a thief/spy/adventuress, but above all else she is a reader, one who in the end wants only “to shut the rest of the world out and have nothing to worry about except the next page of whatever she was reading”. The author could not have found a better way to endear her to us readers than this, indeed. 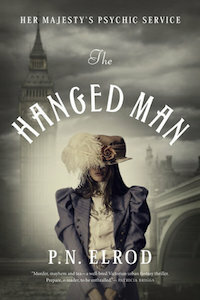 There is little time for Irene to dwell on all this, however, since the version of London in which the two find themselves presents several obstacles to the assignment: a late nineteenth Century alternate with steampunk overtones – think of Zeppelins and steam-powered machines – where Fae, vampires and werewolves coexist alongside normal humans. On top of that, the book Irene is looking for has just been stolen after the murder of its latest owner, and she finds herself working alongside Detective Vale (this world’s version of Sherlock Holmes) battling with steam centipedes, clockwork alligators and various other contraptions, while supernatural creatures drive forth their own agendas and a dark figure from the Library’s past – the mythical Alberich – extends his murderous shadow over everything and everyone. This unstoppable flow of surprises and death-cheating adventures keeps the story going with good momentum and at the same time serves to flesh out Irene’s character more: what I like about her (apart from her love of books, of course) is that she’s skilled but not overconfident (unlike her previous teacher and sometimes competitor Bradamant) and she takes her mentoring duties toward Kai quite seriously, trying to avoid the mistakes Bradamant made with her, when she hogged all the praise and heaped any blame on Irene. Moreover, she’s ready to face the dangers inherent in her chosen work – and more than once, in the course of the story, she suffers damage of some sort – but she’s not reckless or stupid, nor does she fall into the “heroine needing help” narrative trap. Irene feels quite real as a character, because she’s driven and willing to better her position in the Library, but at the same time she’s aware of her limitations and knows when to move aside in favor of people with more experience. The overall mood of The Invisible Library reminded me a little of Gail Carriger’s Parasol Protectorate series: the coexistence of werewolves and vampires, the steampunk elements, the mysteries hiding behind every corner, but where Carriger’s work is a headless romp carried by tongue-in-cheek wit, Cogman’s brand of humor is more subdued and far less outrageous – unless she decides to have a refined party crashed by mechanical alligators, that is. The light-hearted fun mixed with more dramatic events creates a good blend that makes for a swift, entertaining read: it might be a little on the thin side, as far as the plot is concerned, yet there are times when some lightness is not only welcome, but rather necessary for a change of pace, and I believe this series might become one of my go-to stories when I want to… take a breath from more intense reads. There are a few elements that detract from the overall positive experience though: for example, the moments when the characters fall prey to the need for lengthy exposition, going over previous occurrences and recapping them in painstaking detail – to me these segments felt like wading through quicksand where a moment before I was flying on a dirigible. And the Language – fascinating concept that it is – seems to be used too liberally, to the point that it takes on the shape of a convenient plot device rather than a tool to be employed in the direst of circumstances: as if to drive this point home, it seemed to me that Irene’s skills were brought in better light when she was momentarily unable to use Language, rather than when she wielded it as a weapon at the drop of a hat. These little snags notwithstanding, I enjoyed The Invisible Library quite a bit, and will look forward to the next installments in the series, one that I can recommend for its high entertainment value. Steampunk has often been a difficult genre for me, and only the recent acquaintance with Gail Carriger’s Parasol Protectorate series changed my outlook about it, while thanks to P.N. Elrod’s The Hanged Man I have reinforced my conviction that I should explore it more often. Unlike Carriger’s work, this novel adopts a far more serious tone, but it’s just as involving and peppered with fascinating characters and situations: one of the happy instances where I’m glad there will be more books to follow this one, not to mention hopeful that the many tantalizing hints seeded along the way will be developed further. The action takes place toward the end of the 19th Century, a time period quite different from the one we’re familiar with: Queen Victoria did not marry Prince Albert but an English noble and she has been the promoter of several enlightened laws, including the vote for women and the creation of the Psychic Service, tasked with aiding police work through the use of psychically gifted individuals. Alexandrina Victoria Pendlebury is one such person, her gift being the ability to sense residual emotions left over in a crime scene: she is called to “read” an apparent suicide that she’s quickly able to rule as murder and a very peculiar one at that, since there are no emotional traces from the killer, as if he were a ghost. This inexplicable detail is compounded by a dramatic finding that affects Alex on a deeply personal level and that launches a dangerous investigation that will touch several layers of London society and pull her and her associates into a labyrinthine path of baffling discoveries and convoluted misdirections, carried out at a breathless, breakneck pace that kept me glued to the book and, at times, reading on until the small hours. If the story itself is a compelling one, rich with unexpected twists and turns, the characters are just as fascinating: Alex is a complex heroine, a person who found a useful channel for her gift but at the same time is wary about it and highly conscious of the way it keeps her, and everyone else equally gifted, apart from mainstream society. This is indeed one of the best features of the story, showing how such peculiar abilities can be a mixed blessing: on one side, people with psychic talents risk being overwhelmed by them (like Alex’s own mother, who received no training and succumbed to madness) and on the other they are looked at with suspicion and not completely accepted by the general public. In Alex’s case, her perceptions expose her to the best and the worst of the human soul, while the misconception that she can actually read thoughts breeds uneasiness – and sometimes distrust – in those she meets, and the fact she’s a woman holding a job adds to the mix in an unfavorable way: despite social reforms, British society is still very much like Victorian England as we know it, and such activities are frowned upon if not openly ostracized. There is a definite feeling of loneliness permeating Alex’s psychological makeup, and despite her successful handling and rationalizing of it, despite her pragmatic approach to life, one can perceive how the emotional barriers she built around herself – out of necessity because of her gift, and out of defense against the world’s reactions – are starting to close in on her. There are a few traumas in her past, the biggest being the perceived abandonment by her father (a detail that will turn into a surprisingly unexpected revelation toward the end of the book, one of the very best in the story), and Alex does not even enjoy the support of family, since both branches of it suffer from their own peculiar quirks, yet we are afforded some glimpses into the friendships she’s slowly (and ever so tentatively!) building in the Service. Lieutenant Brooks – the somewhat reluctant new addition to the ranks – is the most interesting one of course, due to the careful hints at a romantic relationship: I appreciated how such possibilities are being built with careful slowness, and moreover there are some secrets in Brook’s past that might provide fascinating developments in the future. The author’s choice not to transform their meeting into love-at-first-sight is a clever one and I’m certain it will pay handsomely in the near future. Other remarkable figures are Sir Richard, the Service’s commander, and Colonel Mourne: both possessing a gruff, no-nonsense attitude, they look more unfriendly than they really are, but at the same time they seem like the kind of people that could bring Alex out of her self-imposed exile and help her tap her abilities to the fullest. Inspector Lennon of Scotland Yard falls into this same category: bluntly outspoken and rough-mannered, he’s one of my favorite secondary characters, acting in delightful counterpoint to the more refined ways of the Psychic Service. I’m eagerly looking forward to the next book in this series, indeed.